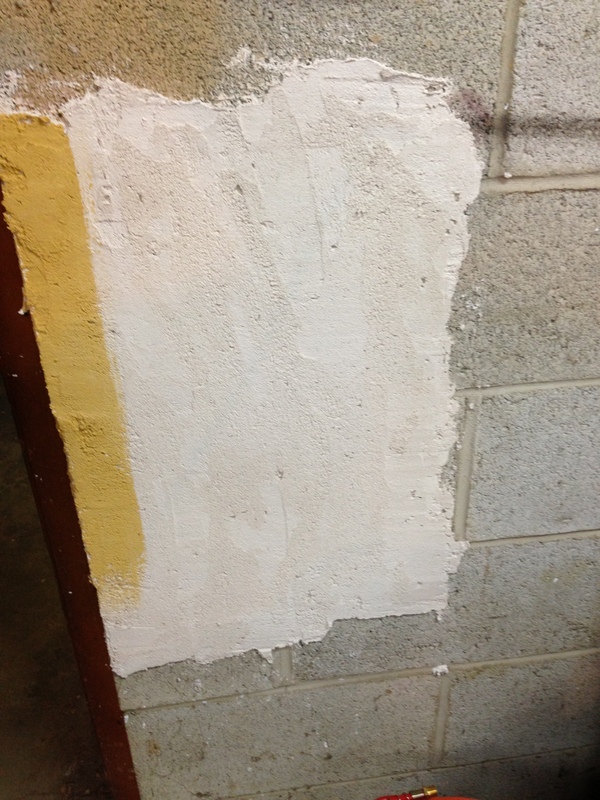 I’m often asked how soon can lime plaster be painted. Well, it depends on what kind of paint is used. In the past when the plaster was on newly laid masonry it could take up to a year before it was painted. This was due to both the high pH of the lime in the hydroxide phase but also because it took that long for the masonry mass to dry out. Generally we are plastering old masonry or wood lath, so the drying time is much shorter. But the high pH (about 11-12) is still the problem as it will attack the paint until the lime carbonates and the pH eventually reaches about pH-7. In fact, many have made the fateful mistake of applying oil or acrylic paint over too fresh plaster, only to have a reaction that creates a big soapy mess as the oil is saponified. Does that mean that since lime plasters cure relatively slowly you can’t put anything on the surface for months?! Obviously limewash because of its compatibility can be applied as soon as surface carbonation takes place, in as short as 24 hours ––although we usually let the plaster cure no less three weeks as the application of any coating, even limewash will interrupt the movement of carbon dioxide from the air into the interior and thus slow down the internal carbonation of the plaster or stucco. I didn’t see why casein on fresh plaster wouldn’t work. But admittedly I had not tried it. I beat up a bucket of lime mortar that has been sitting around the shop for several months and spread a couple of trowelfuls of it on an interior block wall that was bone dry. I floated it with a wood float an hour later. Wood floating opens rather than slicks the surface, increasing the carbonation rate to the interior and also compresses the mortar to accommodate for water loss. When I returned the next morning the surface was well carbonated, having a hardened crust. That next morning I mixed up some fresh casein or milk paint and brushed on a bright yellowy mustard stripe which took to the surface well. When I checked a few hours later it was quite dry and not chalking at all. For those of you that don’t know anything about casein paint, it is casein from milk reacted with lime in water to create a pretty tough mineral-and-protein crosslink. I use the milk paint from Old Fashioned Milk Paint Co (milkpaint.com) and like their nice array of brick- and masonry-related colors. Many brick buildings between about the 1870s and 1910s were painted this way but don’t appear painted because of the extremely matte thin applications of casein paint. Without knowing it, you have probably seen 130-year-old paint on many buildings and not realized what it was. By the next morning, I began testing with pH paper. Adding a bit of water to the surface helps draw forward the higher pH from the uncarbonated interior of the plaster. While surface pH was low, it was still quite high at the interior. 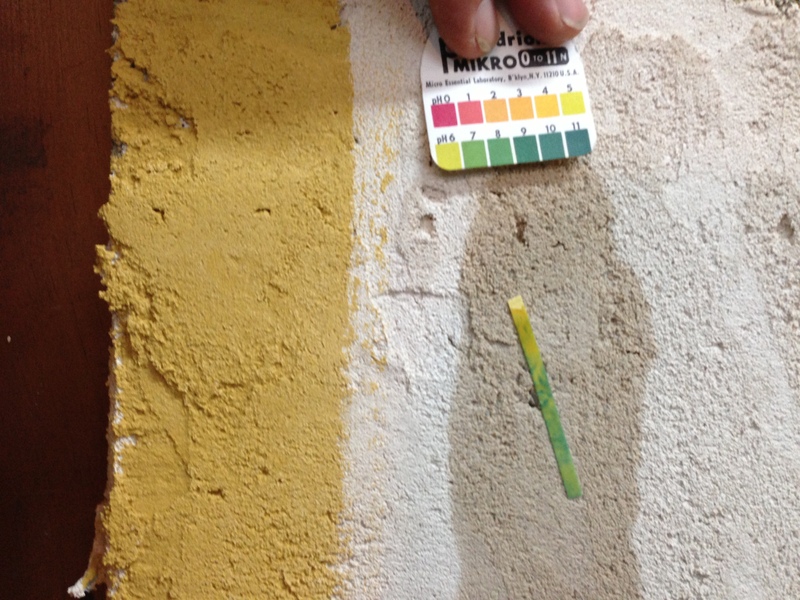 Since any coating can alter moisture conditions, it is important to consider interior pH. Despite the higher pH the casein looks great and shows no deterioration. I tested the plaster over several more days. By the 4th day, the surface was down to pH-7, but the water would eventually rise to pH-10. pH ranges on a scale of 0-14 with most acid citrus products at about pH-3 and baking soda usually around pH-9.5. Since pH-7.5 is considered neutral, a reading of 10 still shows the lime putty’s original high pH of 12 has not been neutralized by complete carbonation. When fully carbonated, lime mortar should be at pH-8. This little experiment also demonstrates how rainwater mobilizes the hydroxides in the uncured lime beneath the surface. As the rainwater mobilizes the hydroxide inside, it can bring this forward to the surface where it can fill cracks. At the same time, acidic rainwater acting on the lime slightly dissolves and then realigns the surface lime repeatedly, allowing the crystals to realign and nucleate on one another to create the increasingly tough calcite surface, as well as seal up any cracks that may have occurred. This brief mention of pH is something we will come back to over and over again, because the pH of materials is at the core of diagnosing and treating deterioration processes. This entry was posted in Mortars, Paint and tagged casein paint, lime mortar weathering, milk paint, Old Fashioned Milk Paint Co, painting fresh plaster. Bookmark the permalink.